I’ve made a lot of progress on my cardigan since I last showed it to you. I'm happy to report that my previous concerns about the size of the armholes were apparently unfounded. 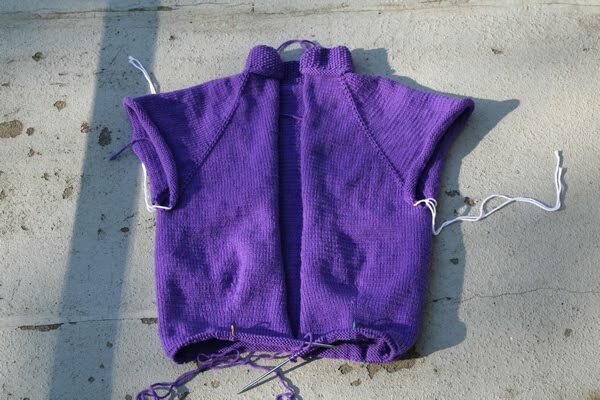 The pattern, as written, produces a fairly cropped sweater. It’s not that noticeable from the picture in the book, but the featured photo on the Ravelry page really shows how short it is. Like many others before me, I’ve added several inches of length. Since it’s knit top-down in one piece it can be tried on periodically and adjusted as needed. It’s a time-consuming process though – having it on the needles distorts it enough that you really need to thread it on a piece of waste yarn to try on. And then put it back on the needles, knit another several rows, and do it all over again. For anyone who cares about technical specifics, these are the exact changes I have made: Before the waist shaping it says to do 17 rows of stockinette; I did a total of 35. After the waist shaping you are supposed to work 7 rows in stockinette, and I did a total of 19. All together, that’s 30 extra rows, or almost 4 inches (I am getting 8 rows/inch.) Here's a close up of the waist shaping. Adding length means I’m using more yarn, of course. I have more than enough since I originally bought it for a long-sleeved cardigan, but the small yardage per ball means many ends to weave in. Compounding that is the fact that I keep coming across odd little patches where the yarn appears to have been spliced together with glue (ok, I may be making that up, but that is what it feels like!) and I need to cut those parts out, resulting in more ends. 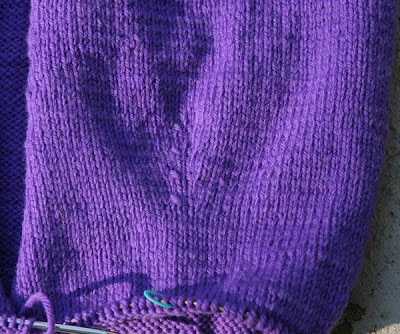 Still, knitting it all in one piece greatly reduces the necessary finishing. And I still really like the yarn – great color and the price is right!